In conjunction with our Streaming Media West show, taking place Oct. 30-31 in Los Angeles, we are launching a brand new conference that will focus on video deployments within the enterprise and education verticals. The new show is called the Enterprise Video Conference and we’ve just launched the website at EnterpriseVideoConference.com and have opened the call for speakers. The call for speakers is only open for 3 weeks and closes August 20th. 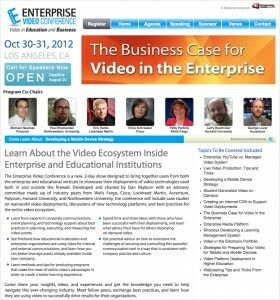 While there are plenty of conferences that touch on the subject of video, the Enterprise Video Conference will focus exclusively on the topic of business video, with nearly 75 speakers across 2 days and 20 sessions. The event will also showcase nearly 20 case study presentations from those who have successfully deployed video within their organization. So if you are responsible for deploying video technology and platforms inside your company, please consider doing a 20 minute presentation at the show. If you want to be considered for a speaking spot, please get your submission in now via the website. If you would like to talk to me about an idea you had, a presentation you want to do, a topic you want to see covered or have any questions about the speaking selection process, call me anytime at 917-523-4562. Vendors are welcome to submit speaking requests but they MUST also submit with a customer. If you have any questions on this, pick up the phone and call me. If you send in an incomplete speaking submission form, it won’t be considered. I know many vendors want to be involved in the show and if you have any questions at all about speaking, do not wait to reach out to me. Contact me immediately as the speaking spots will full up very quickly. I have already received more than two dozen speaking request from some excellent end-users, so some spots have already been filled. This isn’t our show, it’s the industry’s and this is your chance to give feedback, pitch in and help make the Enterprise Video Conference showcase that there is more to video than just media and entertainment content. Video deployments inside the enterprise and edu don’t get enough credit and with your help, we can change that.